The sports bar is a very unique place where people go to have a drink as they enjoy their favorite sports. Just like any place of leisure, the bar needs to be hospitable, welcoming, and well decorated. In case you are looking for the perfect sports bar décor, there are many great ideas out there that you can use. The most important thing is to deliver a comfortable and inviting ambience. As easy as this may sound, it’s not always straightforward. The most important thing in building the best sports bar décor is to do your homework. As a newbie in interior décor, there are so many things that you will need to learn first before you are able to complete the job. Start by visiting sports bar in your city or town and see what they are doing in terms of decorations. Make sure you pay attention to the designs that really appeal to you. The key attributes to look out for in any décor are simplicity, creativity, and uniqueness. Secondly, you will need to choose a theme for the bar. There are so many themes to consider. For example, if you are opening a sports bar close to a stadium, the colors and memorabilia used should resemble the team colors of the sports club that plays in that stadium. If the bar will be showcasing different types of sports, try to create different zones for each sport. Each of these zones must have the right memorabilia and décor that resonates with the sport they show. Choose the right furniture too. The comfort of customers is a big deal in any sports bar. On average, a sports game will last over two hours and during this time, you want to make sure that the sports fans following every minute are as comfortable as possible. Picking the right furniture guarantees this. Try and also think about the space. Big furniture pieces are probably not ideal. You need furniture items that are comfortable enough for patrons to use and small enough to accommodate as many people as possible into the bar. 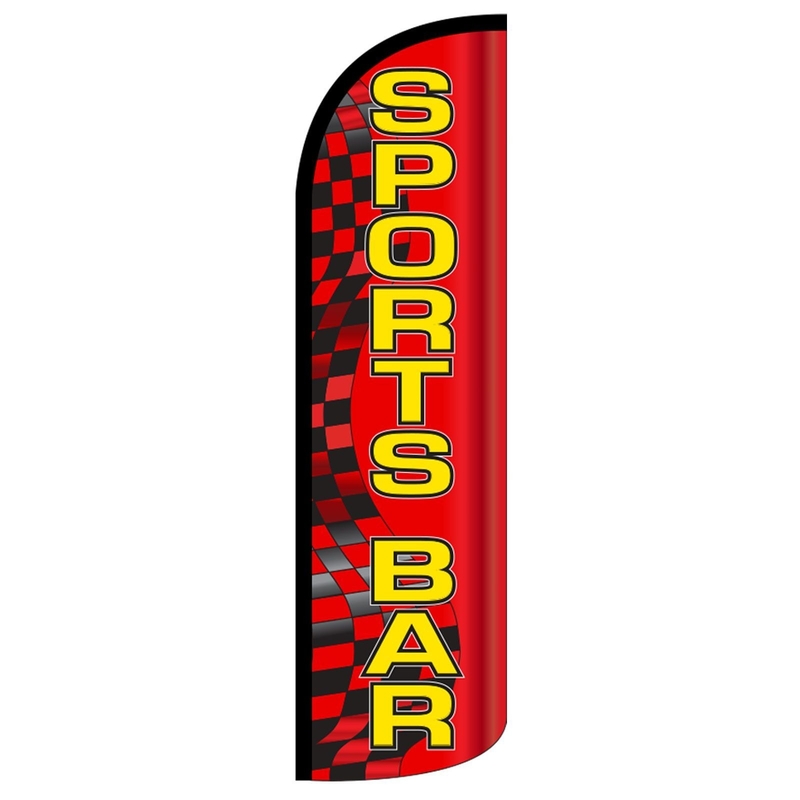 If you are planning to put in place one giant sign to attract patrons to your bar then you can use this simple Sports Bar Deluxe Swooper Flag. The graphics are imprinted using dye sublimation. The flag itself is constructed using UV treated lightweight polyester. It’s an affordable choice to have and it’s also a great attention grabber. Hockey fans will definitely appreciate this sign. The sculpture is a work of art created using multicolored neon lights. The piece can stand on its own or hanged somewhere on the wall. It’s the perfect themed décor piece that can be used to lighten up the bar and set the right sporty mood. This Sports Golfer Neon Sign is also a neon-based sculpture. It’s a decorative piece artfully designed to reassemble a golfer at tee time. Although it’s a golf-themed memorabilia, it’s a great sign for any sports lover. It comes with its own stand and can also be hung on the wall. Neon signs and bars go hand in hand, right? Well, this Sports Baseball Player Neon Sign is another neon sculpture only that this time it features a baseball player with a bat in his hand. Baseball is, of course, a popular sport in the US and if you have a section in the bar designated for it, this is the décor to attract its fans. This sports bike is constructed using pure iron. Its colorful body is the perfect complement for bold and solid colored bar walls. The bike is best used as an accessory to liven up interior walls and its design is very unique too. You may also need to add a holiday theme to your style with a few Christmas ornaments. An assortment of ornaments like glitter snowflakes coupled with brightly colored ball ornaments should do the trick. Try to also mix it up a bit with Christmas themed lighting. The lights do help set the holiday mood and your sports bar could really use one during the holidays. This Sports Football Helmet Neon Sign is going to thrill the football fans. The neon sculpture has colors to present an artistic football helmet that can stand on its own or hang on the wall. It’s one of the most ideal sports-themed accessories that you can use to spice up your walls. Sports aren’t just about fun and winning but also about life lessons such as teamwork, setting goals, and building character. Well, you can add some patriotic character to your sporting wall with this American Sports Wall Decal. It’s basically an artistic American flag showcasing four of the most popular sports in the country. It’s the kind of memorabilia that every sports bar should have. If you are looking to create a guest suite ensemble or a gallery display in your bar, this simple and unique accent will do it. The Personalized Sports Wall Décor is perfectly sized to fit into any wall without making it too cluttered. The product is made from 100% wood and it’s finished with brightly colored accents to deliver the perfect look. This art set features a number of things. First, you get a well-drawn print reading “Sports Bar.” It also has images of beer and the message “the game is always on.” The set also features images of footballs, baseballs, and basketballs. It’s the best signboard to advertise your sports bar.